Overwhelming worktop choices, mind boggling cupboard combinations, buying a new kitchen has been a roller coaster of emotions so far. I want to take you on the journey with us, step by step until we have the final reveal next spring. 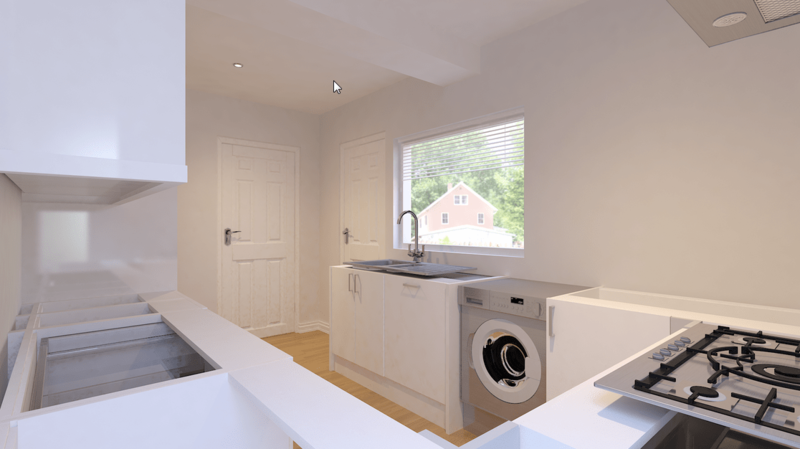 A full kitchen refit will be the most expensive change we make to our home so we’re taking it slowly, thinking it all over and hopefully getting it right. If you’re at the planning or dreaming stage right now, we got heaps of kitchen ideas from websites like Homify, Houzz and House Beautiful. It took a long time to come up with what we have so far. Let me walk you through it. As you can see, we’re missing a few filler pieces, the odd cupboard door, a top plastic splashback for the oven, oh and worktops! Our kitchen is quite long and thin so we decided to group most of the storage in to a ‘bank’ of units rather than fill up all the wall space. This helps to avoid the galley effect and makes the kitchen feel more spacious. 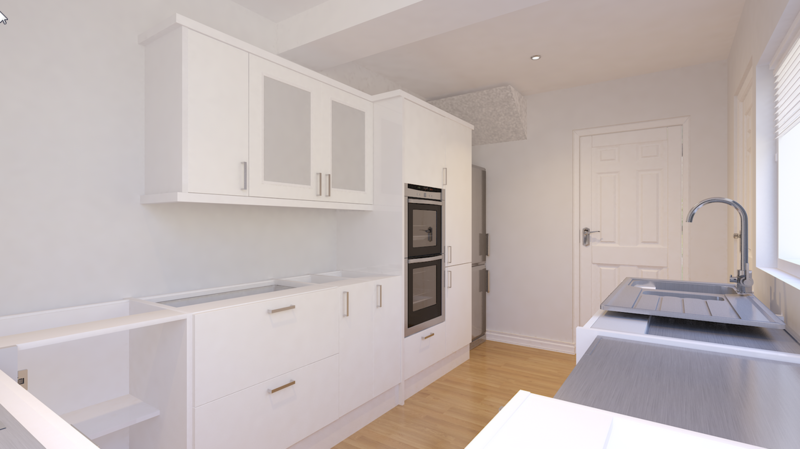 The cupboards we’ve chosen are from the Wren Designer range with white gloss doors. They have better quality cabinets than the extra value range and came with a 20 year guarantee. In our existing kitchen, we have a freestanding cooker at the far end which means getting down to floor level to check on things in the oven and lift out heavy pots. We decided to split that up to make the oven more accessible and also bring in plenty of storage under the hob for pots and pans. Despite having two drawer fronts, there are actually three drawers inside with a shallow drawer at the top for utensils. From this angle you can see that the fridge looks a little bit lonely at the end there but we have a plan. Although a built in fridge probably would have looked better, we only bought that one in 2013 so we’re going to integrate it by building in a wine rack above the fridge and putting a filler piece between it and the wall. This also tackles the awkward sloped ceiling in that corner without wasting any space. We plan on painting the wall at the end with chalkboard paint for shopping lists, notes etc. That was one of the few things Matt and I both knew we wanted in the room. To the left of the ovens we have two narrow cabinets, one is a pull out rack for all of our spices and who knows what will end up in the other cupboard. Maybe it will become that catch all kitchen cupboard, you have one too, right? Sticky tape, notepads, a signed Christmas greeting from Scroobious Pip – really, we have one in there. The washing machine/tumble dryer combo that Matt’s Mum kindly gave us means we had room for the top item on my wish list; a dishwasher. Hallelujah! It fits nicely under the draining board of the sink and will make cooking in the kitchen much smoother for me. This far end is quite a dark part of the house. A lot of light is blocked by the house next to us so if we’re working at the end of the kitchen by the hob, the light is almost always on no matter what time it is. To combat this we’re planning to put a in a roof light at this end. Why this wasn’t done when the kitchen extension was built I don’t know as it will make a huge difference. You can see where the original kitchen ended by the beam in the ceiling. We also plan on adding shelves to the corner you can see on the right of this picture for things we use often; rice, quinoa, pulses etc. That’s it so far. The skeleton of a kitchen without all the choices that make it personal like wall colours, worktops, floor tiles and art work. As we pick these out I’ll be keeping you updated and sharing any tips and advice we’ve picked up along the way. You can also keep up with the planning process by following this Pinterest board. What would you like in your dream kitchen? Would you change anything that we’ve planned? This post is part of a collaboration with Homify.